Steve Orlando continues his trek into the Microverse in Justice League of America! Out of the few places the JLA have visited since Rebirth, this is easily the most interesting. Unfortunately, there’s a lot to take in before we can truly understand this world… Possibly too much. I’m going to be honest, this issue is a step down from JLA #12. There’s not a huge dip in quality, there’s just a ton of exposition. Now, I’m not a fan of exposition, but in this situation, it is needed. I keep viewing the Microverse as a new world, but we all need to remember that this is a separate universe. Key word: universe. As in there are multiple worlds, and with each world, we’re going to encounter different races, lifestyles, and climates/ terrains. This naturally will result in exposition, so swallow that realization now, and it will make your reading experience more enjoyable. If you haven’t been tuning into Justice League of America, or perhaps you dropped the title earlier in its run, you might want to dip your toes (back) into the water! This is the story we’ve been waiting for since DC Universe Rebirth, where Ryan and the JLA go in search of Ray Palmer. “Crisis in the Microverse” is easily the most intriguing mission yet for Batman’s Justice League, and considering we’re exploring a new universe with new, interesting characters, we get the sense that anything can happen. In addition to this, Orlando is beginning to hit his stride in regards to balancing plot, pacing, and character develop. Ensembles can be difficult to write, and it’s taken him a little time to reach a level of quality that should satisfy most fans. At the moment, Batman, Ryan, Frost, and Lobo are in the Microverse, and have been encountered with force. They clearly know nothing about these worlds, or how where to begin in finding Ray. A lead Ryan thought he had led him to Ray’s bio-belt, but not Ray. Instead, the team encounters two separate individuals who claim to know Palmer, but their stories of what happened to him don’t match, and it becomes clear one of them is lying. Just as the team desperately needs assistance from someone who is familiar with not only the universe, but Ray’s last moments before disappearing, they’re forced to make a gambit and choose a stranger to trust. Naturally, the wrong decision could lead to their downfall. Meanwhile, on Earth, Orlando sets up what appears to be a future arc with a character who previously made a cameo. In all, this is a decent issue that progresses the story well, adds some needed elements of intrigues, and unfortunately lags due to exposition. With this set-up out of the way though, the remainder of the story should be fast and furious! The Art: Reiss continues art duties for “Crisis in the Microverse,” and considering his work is one of the highlights of the story, I hope he’s able to finish out the arc. If anyone at DC is seeing this, consistency means a lot to fans… Just saying, I know he has a Dark Matter series waiting in the wings. Anyway, not only is his art strong because of his technique and technicality, but also because of the storytelling, he’s able to present through his art. We learn so much from these new worlds strictly because of his vision of that world, and that helps sell Orlando’s script! The Microverse. The Microverse is an interesting universe, and if the Atom gets his own series, I hope the creative team decides to explore it further. There are so many different stories, characters, and adventures that we could dive into, and “Crisis in the Microverse” isn’t going to be able to cover that much ground within six issues. Regardless, The Atom book or not, this world doesn’t need to go to waste. Who to Trust? As I suspected, the person wearing Ray’s bio-belt is not Ray, but is a native of the Microverse named Preon. She claims to have worked with Ray in his mission, along with a secret partner of his, Aron Aut, and describes how both Ray and Aron were lost due to a quantum storm. The only thing is… She may not be trustworthy. Despite the need to work with someone who knows and understands the Microverse, the League knows nothing about Preon. She becomes recognized by locals on a planet as one of the “Docent Folk.” The description alone implies Preon is a guide or teacher, but there’s something odd about her reaction to the locals recognizing her. This alone creates doubt, but the moment Aron Aut appears and labels her a liar and a threat to the League’s life, the story completely turns on its head! Not only is this story now a rescue mission, but the League will need to trust one of two people, and that decision could mean life or death. 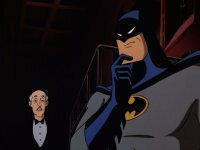 Batman remarks that one of them is lying, but honestly both could be lying to a degree, so watching to see who they choose to trust will be interesting. Afterthought. Back on Earth, Canary and Ray meet up in Seattle and rehash some of Ray’s personal drama from previous issues. More on that in a bit… What I want to talk about now, is Afterthought. Afterthought was introduced in Midnighter, and while I assumed his appearance in issue 12 was just a cameo, it appears to be much more than that. After previously fighting Frost, he now goes after Canary and Ray… But he seeks them out, and when asked why, he states he’s, “testing the field.” This is clearly foreshadowing and set-up for a future arc, but the real question is, who’s behind Afterthough because we know he’s just a lackey. As much as I enjoy this moment, I do wish Orlando would’ve saved it for the next issue since so much explaining and exposition needed to occur to set-up what’s going on in the Microverse. I would have been ok if this issue only checked in with Batman, Ryan, Frost, and Lobo. Domestic Troubles. There’s a minor tiff between Lobo and Frost early in the issue, and it’s completely unnecessary. I know that both characters are morally ambiguous (at best) at this point, but having the two argue at a time like this is petty. I’d honestly like to think they’re both above it, but maybe I’m wrong. Ultimately, the brief moment felt blown out of proportion and had poor timing. The Exposition. As I said above, there is so much exposition in this issue. Nearly the entire issue is spent explaining the Microverse, different worlds within the Microverse, what Ray’s mission was, how they might be able to find him, and about a “thinking planet” is their only source of hope. It’s too much to take in. It’s interesting, but too much to cover in a single issue. Again, it’s not bad, but if you’re looking for a relaxing read, then you might want to hold off on this issue for another time so you can process all of the information. Emotions. Orlando infused some character moments in the way of developing relationships further, but none of them are executed well in my opinion. Ryan and Frost had some moments (Frost sticking up for Ryan; the kiss) but both felt out of place. Back on Earth, Canary and Ray meet up in Seattle to talk. I love the concept of this, but what Canary and Ray discuss feels as though it’s rehashing moments that don’t completely need to be discussed. Ray is starting to appear as if he’s all over the place emotionally, and I want to see a little more consistency with him as a character. Ryan’s Deduction. How does Ryan come up with the idea that he needs to shrink more to speak to Moz-Ga. If it’s a thinking planet, and they need the planet (which they are currently on) to respond and provide safety for them, then why would Ryan need to go smaller? This just doesn’t add up to me. You want to follow up on Ray Palmer’s story from Rebirth. You read “Crisis in the Microverse: Part One” and thought it was awesome. Preon, Aron Aut, and Afterthought! Oh my! Heavy exposition and a strange, new world create a bit of a speedbump in Justice League of America #13. It’s not a huge issue, but there is a lot of new information to process. Thankfully, with this exposition, Orlando also introduces two interesting plots concerning who the Microverse team can trust, and what Afterthought is planning for the JLA on Earth. Both of these elements add a jolt of momentum and intrigue to an already interesting rescue mission! I’m hoping that the exposition is out of the way, and we can spend the next four issues riding out the plot!